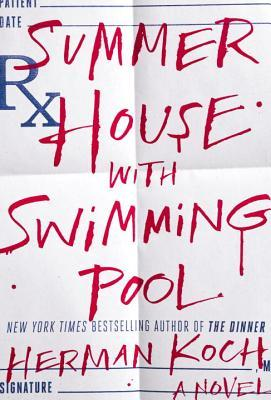 Author Herman Koch has created the doctor we’re all afraid of in his new novel, Summer House with Swimming Pool. Not a horrific needle wielding monster but something worse: the one who pretends to care but really despises his patients. Dr. Marc Schlosser listens to his patients’ complaints and seems to be sympathetic and attentive but is really thinking about the beach and what a boring hypochondriac you are. I used to let the patients talk for the full twenty minutes. After that they would go home feeling relieved. The doctor had given them a prescription and urged them to take things a little easier. One of Schlosser’s patients is a stage actor who, after inviting he and his wife to one of his plays, remarks to Schlosser about his wife’s attractiveness, a comment that rankles and begins what is Schlosser’s obsession with Meier and what he perceives to be Meier’s inappropriate lewdness towards women. And yet, this revulsion propels Schlosser towards Meier instead of away. He misleads his wife and chooses a summer vacation site close enough to Meier’s summer house that their paths cross within days. His thirteen-year-old daughter is taken with Meier’s fifteen-year-old son and Schlosser himself flirts with Meier’s wife while mentally despising Meier for his leering attitude towards every woman and girl they encounter, including Schlosser’s daughter. This combination of awkwardness explodes the night of a large midsummer celebration when like the fireworks, everything goes off badly and with results just as catastrophic: His daughter Julia has been found on the beach unconscious. When Julia regains consciousness she is hysterical and appears to have been raped. Her inability to remember any of the details or even who assaulted her is the catalyst for Schlosser’s rage against Meier and leads him to take action of his own. Summer House is told only from Schlosser’s perspective which is as it should be because although there are many stories and events the only thing that matters is Schlosser’s perceptions of what happened and how that influences the choices he makes throughout the novel. Even by the end there is no certainty that the truth has come out although there is a very great likelihood it has and that Schlosser’s actions are indefensible. At the very least his breach of medical ethics, much less personal ones is egregious. Koch proved himself in The Dinner as a writer who can walk the fine line of moral dilemmas and how morals can be highly relative, depending on the situation. The Dinner was shocking and striking and Summer House achieves many of the same effects but as it spans a much longer period of time the tension is not easily sustained. Where the novel loses strength is in Schlosser’s reminiscences of medical school and of one professor in particular. There is much made of homosexuality and pedophilia with a confusing conclusion about why both are biological abnormalities but where this fits into what is a psychologically complex story is unclear and serves only to deflect attention away from what is really happening. Summer House unsettles and challenges the reader and their conclusions or judgment just as Schlosser himself is challenged. I love this post. There’s more to say… But I just wanted you to know its fabulous. Wow- thanks, April! It is one funky book. Awesome awesome review. I know this one is going to bother me but I want to read it so bad! You are so right on about this book! He is a terrifying doctor and while a lot of the time first person narratives grate on me because it’s all about perception, in this one, you’re right. It’s the only way as what Marc’s perception of what happened is the only thing that matters. I’ve read that a lot of people have a really big issue with the way that it ends, that there is no real conclusion but I suspect that that’s what Koch intended. This book sticks with you for a while. Great review. Just reading your descriptions made me skin crawl with the creepiness i felt for the characters. I’m going to see Koch at the Edinburgh Book Festival soon. I picture him as being a perfectly nice guy who can write the awful characters, but maybe he’s just faking being nice like the doctor! What fun, Tanya! It will be interesting to see what he’s like because his male characters are so inwardly dark. Write all about it!